Over the past couple of decades, Final Fantasy has done many things very well: stories, characters, art direction, chocobos, all that jazz. 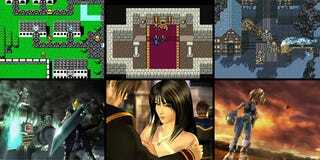 But one thing has always made Final Fantasy stand out among its peers: the music. Most of the credit for that music goes to Nobuo Uematsu, the tremendously talented composer responsible for the beeps and bloops behind Square Enix's ubiquitous RPG series. Classic. The track that started it all. I'M NOT CRYING THERE'S JUST SOMETHING IN MY EYE. One of my favorites. Way underappreciated. This track is really good at pumping you up. Almost makes up for the crazy random encounter rate on the FFIX world map. Man, Gilgamesh is such a ridiculous series staple. I hope he shows up in FFXV. The Opera House scene is up there for Best RPG Scene Ever. Post your own favorites—and other Uematsu thoughts—below.